It’s time you brush up on the better way to achieve a devastatingly clean-cut look. This handsomely crafted shaving staple features a sturdy black handle and 100% animal-cruelty-free synthetic bristles that are absurdly soft to the touch, dry quickly, and work up a rich, foamy lather – so you can swiftly and gently say goodbye to unwanted stubble. This must-have man tool also comes with a small stand, so it can rest peacefully when you want to lead that big, bad beard burn. Prep brush by soaking in warm water for a minute or so. Prep Face by applying a warm damp cloth to your face for roughly 30 seconds. 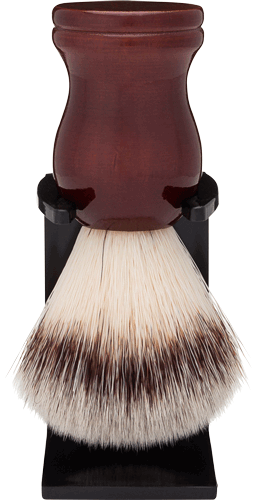 Apply lather by using the brush in a circular motion to draw facial hair outward away from it's roots. Shave with the grain at a 30-45 degree angle - using the weight of the razor to shave. Rinse off face with cold water and apply aftershave or balm to reduce irritation and moisturize skin.